Africa, with its wealth of natural resources and fast-growing population, may have a significant impact on international energy markets over the next 25 years. The International Energy Outlook 2018 (IEO2018) analyzed uncertainty associated with future energy demand growth in Africa by examining a sensitivity case in which a faster rate of economic growth in Africa—compared with the IEO2018 Reference case—results in greater energy consumption and a larger manufacturing sector through 2040. The IEO2018 Reference case projects that real African gross domestic product (GDP) will grow at an average rate of 3.8% per year from 2015 to 2040, and the IEO2018 Africa High Growth case projects an average growth rate of 5.0% per year over the same period. 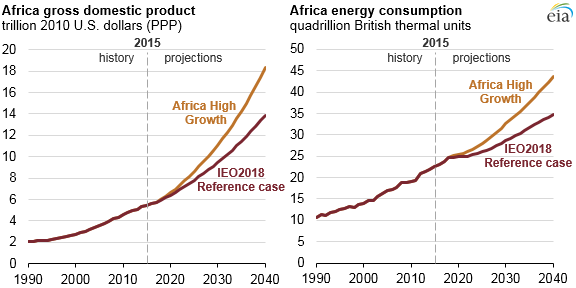 In these cases, Africa’s energy consumption is projected to grow from 23 quadrillion British thermal units (Btu) in 2015 to 35 quadrillion Btu in the IEO2018 Reference case and to 44 quadrillion Btu in the Africa High Growth case. Energy consumed in the industrial sector (manufacturing, construction, mining, and agriculture) accounts for most of the difference between cases. Within the industrial sector, nonenergy-intensive manufacturing—pharmaceuticals and electrical equipment, for example—sees the largest increase in energy consumption. Energy consumption for nonenergy-intensive manufacturing in 2040 is 7.9 quadrillion Btu in the IEO2018 Reference case and 10.9 quadrillion Btu in the Africa High Growth case. The energy-intensive manufacturing sector’s energy consumption increases by 1.0 quadrillion Btu, and nonmanufacturing energy consumption increases by 0.5 quadrillion Btu. A higher rate of GDP growth in the Africa High Growth case leads to African manufacturing growing as a share of the economy and the services share shrinking relative to the IEO2018 Reference case. The manufacturing sector accounts for 19% of total output in the IEO2018 Reference case in 2040, with services accounting for 47%. In the IEO2018 Africa High Growth case, however, the manufacturing share of Africa’s economy in 2040 rises to 24%, and the services share drops to 37%. Even though GDP and energy consumption both grow in Africa in the IEO2018 Reference case, energy consumption per capita declines between 2015 and 2040. Africa’s population growth rate is higher than its energy consumption growth rate, underscoring the difficulties the continent will have in meeting its energy needs. In the Africa High Growth case, however, energy consumption rises from 19 million Btu per person to 22 million Btu per person between 2015 and 2040, compared with a decline to 17 million Btu per person in the IEO2018 Reference case over that period. Although energy consumption per capita in 2040 in the Africa High Growth case is 25% higher than it is in the IEO2018 Reference case, the African value is still lower than in many countries. 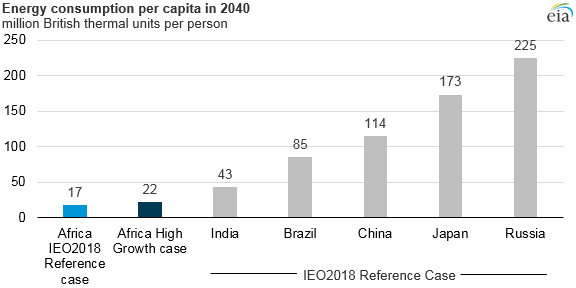 African energy consumption per capita in 2040 is projected to be one-half of the level in India, one-fourth of the level in Brazil, and one-tenth of the level in Russia in the IEO2018 Africa High Growth case. The net effect of the Africa High Growth case on the rest of the world, because of trade and global supply chains, shows limited impacts on other countries—either positive or negative—in terms of output. The biggest effect is on nonenergy-intensive manufacturing in Eurasian countries, where output is 3% lower in the Africa High Growth case. This slight drop occurs because Africa’s availability of low-cost labor gives it a competitive advantage in manufacturing.